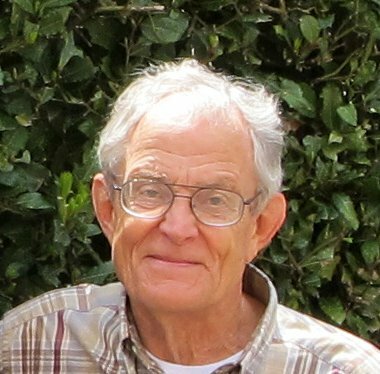 On Tuesday evening, June 13th, longtime Club member, Allan King will be discussing automated watering systems for your outdoor bonsais. (I’m guessing that most spouses don’t allow indoor water systems, as the black tubing can clash with the furniture). Here’s what Allan has to say: “Here’s a brief progress report on the automatic watering/pH system. The drip watering has been fully functional for several years. Ann Erb has been using a hand-watering system with vinegar for a while, and I have I have tried it, but vinegar seems to break down after a day or two. We need something else. The automatic ‘everything’ system is in the works but is not there yet.” The meeting starts at 7:30 pm, but arrive by 7:00 for socializing and checking out books from our extensive library. You may also bring in a tree that you have questions about. A big shouted THANK YOU! to all of you, too numerous to mention individually, who helped make this year’s show, plant sale, silent auction, photos, and demos another grand success. I have always felt that our club does an excellent job of putting on a well-presented show with excellent trees, and this year it was, of course, up to our accustomed standards. However, I gotta admit that as of the Friday morning before the show I had my doubts: Ann Erb had only received entry forms for something like eight trees. Panic led to some quick phone calls to members likely to have neglected to send in their entry forms and sure enough, we turned up enough very nice trees that by the time the show opened on Saturday we were looking pretty good. Next year we do need to make a determined effort to encourage more members to show, and we need to count those entries a little sooner to reduce pre-show anxiety, but this year we did very well and thanks again to all. 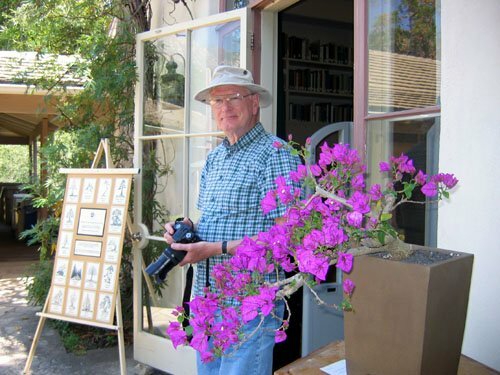 Special events this month include our annual beginner’s workshop at the Botanic Garden on Saturday, June 10 (contact Tom Post for more info), and the workshop conducted by Ann Erb on Saturday, June 17 which is open to all members. Some of the money donated to the club by the family of our late member Sally Gilmore will subsidize part of the cost of the workshop. Cost to members will be only $10.00 for either morning or afternoon session. Contact Wally Kunimoto to sign up. Last Month : Ann Erb: Pots, Stands, And Moss… Oh My! 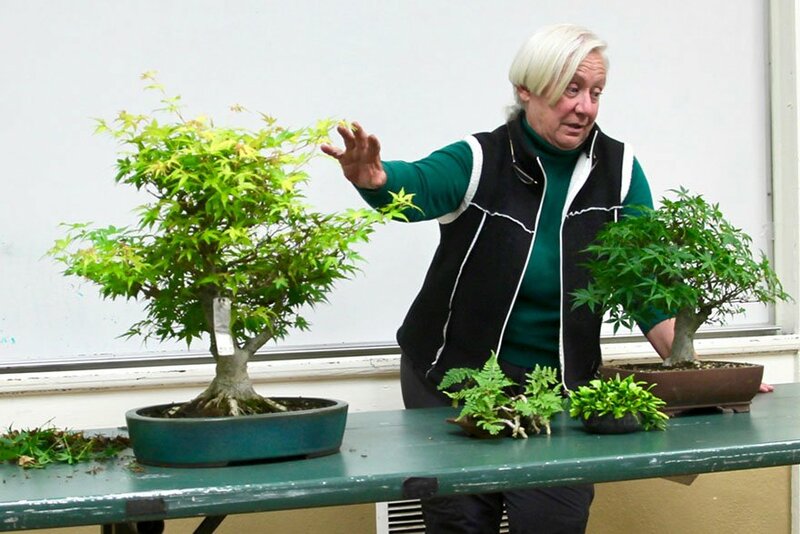 There are a number of things to do in order to show a tree and our Club’s show coordinator, Ann Erb, explained them in detail at the last meeting. As show time approaches, go over your tree and eliminate any hanging branches or cross-overs, and to get rid of spiders, webs, and wine corks (John Bleck uses these to separate branches. He said he has amassed “quite a collection!”). Next you should remove the top inch of soil and replace it with fresh top dressing. This will make it easier to press on pads of moss around the base of the tree. I found some great moss under a bush in our complex and watered it for a week before the show. Our neighbors already think I’m a bit off, so no one bothered me. Pots get water stained, so they should be cleaned. Ann suggests using a polishing block for the heavy stuff, then using mineral oil or baby oil after. The oil can also help protect your pot from future water stains. For really dirty feet, you can stick them into lemons. Not sure if this works for people, too. Two other important aspects for showing are the stand and the accent plant. A stand must be the right size and type for your tree, too big or too ornate may not work for some trees. A proper accent plant should not be too showy, like bright flowers, but should be interesting. Placement is achieved by following the apex of the tree to a spot on the table, either left or right of your tree depending on which way it faces. Ann Erb presents two trees, one ready to show this year and one that could be ready next year. Ann using the polishing stone on tough stains. This stand is too big for this tree. Stand should be slightly larger than pot in most cases. 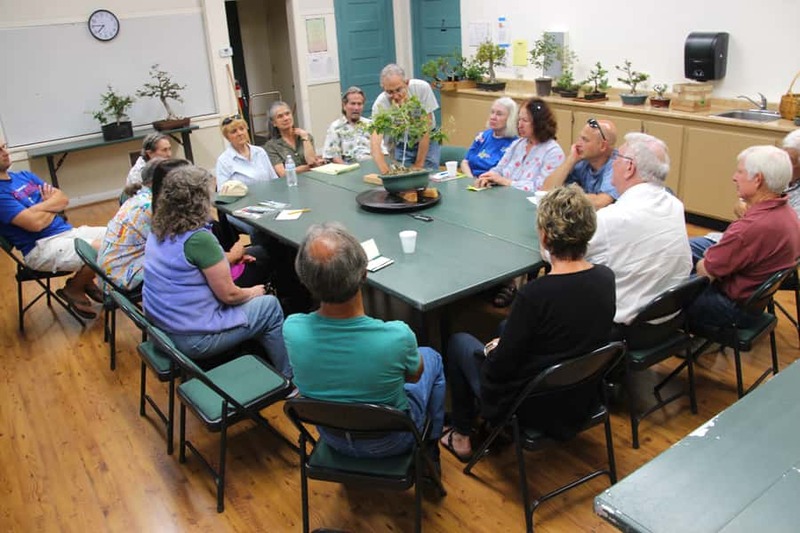 The club will be holding a beginner class at the Botanic Garden on June 10. 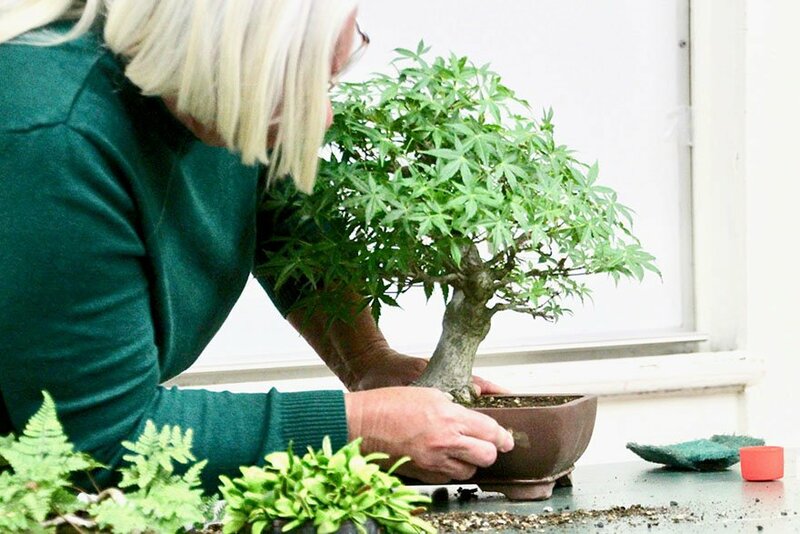 Here’s a link to the SBBC announcement: https://www.sbbg.org/classes-events/classes/create-your-own-bonsai. BCSB and SBBG members pay the member fee of $50, non-members pay $65. Ann Erb will be the instructor and we will need 6-8 assistants to help the beginners style their trees, wire them, and pot them. 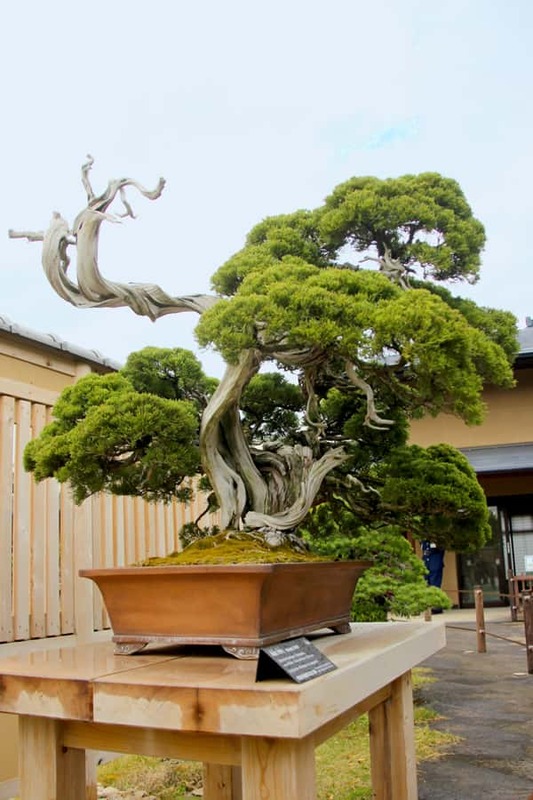 Descanso Bonsai Society: 48th Annual Bonsai Show at Van De Kamp Hall, Descanso Gardens, 1418 Descanso Drive. Show hours are 9AM – 4 PM both days with demonstrations at 11:00 AM and 1:30 PM. 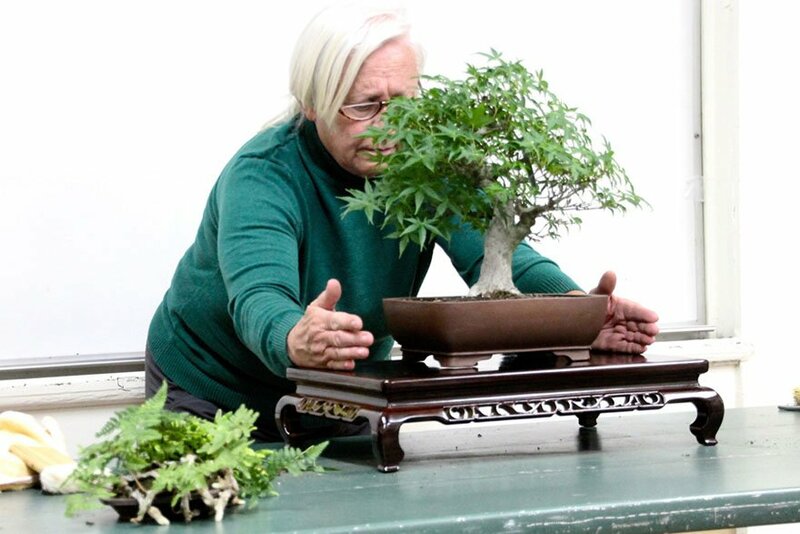 Trees from novice to master exhibitors will be on display. A large selection of trees, pots, plants and bonsai related items will be for sale. All events are free with Garden admission. 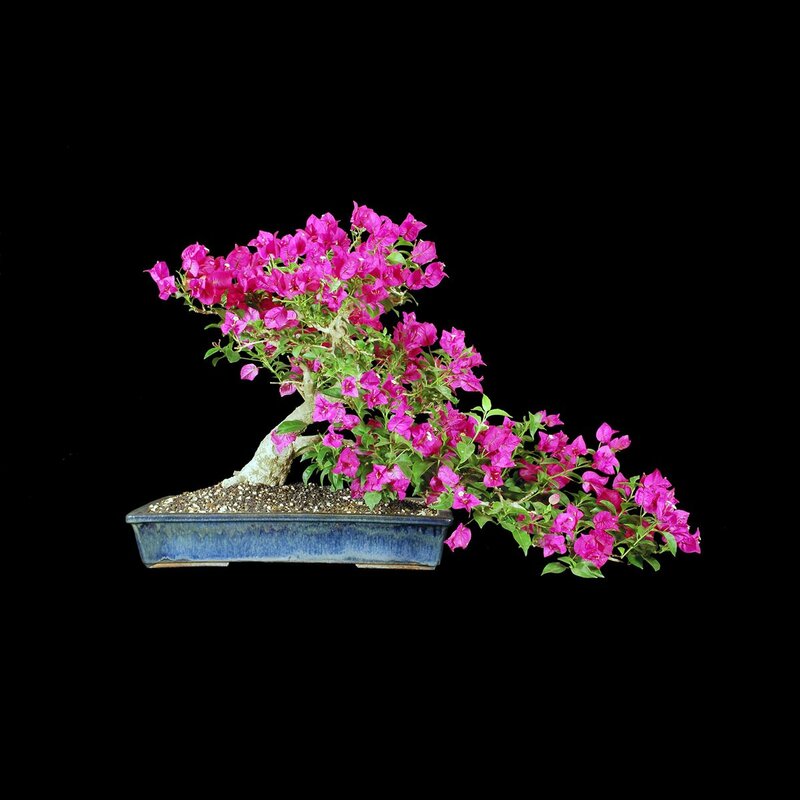 For more information visit our web site, descansobonsai.com. June 17 GVCC: Member Only Saturday Workshop With Ann Erb – $10! We will be conducting a pine de-candling consulting clinic from 8 -10 am on Sunday, June 25, in the bus parking lot, which is right off the Allen entrance to The Huntington. 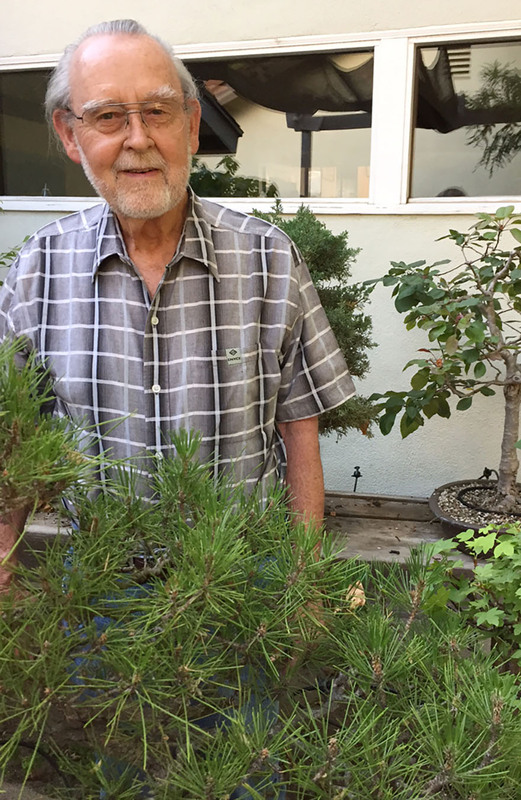 Peter Macasieb has been helping us manage our pines over the past two years, and he has agreed to come in and lead our group in providing guidance and assistance to members of the bonsai community who want help with their pine work. This will be a drop in clinic, open to the public. We will close the clinic at 10 am when HG opens to the public, and head to the bonsai nursery where we will continue our pine work on the collection trees.